What Are Those Shiny Crytals on the Cork? Question from Steve: I opened a bottle of white wine and it had these shiny crystals, kind of like sugar on the cork. Is that wine okay? Reply: Hi, Steve. Thanks for writing! Yup, it should be just fine. A great thing about wine is that even if it’s spoiled it’s not harmful – unless you drink too much, of course! The worst thing that happens is you’re offended by the smell or taste, in which case you should take it back or dump it. MAJOR DIGRESSION: Please don’t use bad wine for cooking. That weird flavor is what you’re adding to the dish, just like any other ingredient, and cooking it down will just concentrate the weird flavor. 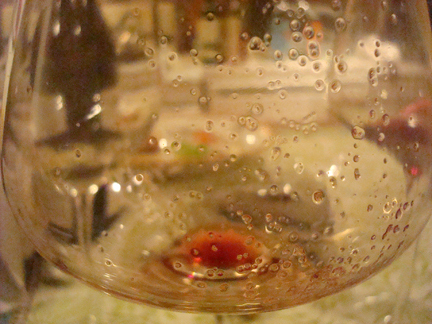 Why is my wine Hazy? Question from Stephen: I purchased a 2008 Pinot Noir from the bargain rack at a wine shop. They were selling the 2009 at full price for $66 got this for $45. Cork was in beautiful shape but wine is cloudy. What could the problem be? Reply: I apologize for the delay in my reply. I figured the best source for the answer is the winery – but, after a few weeks, no reply from them. This is something I will never understand. A real, honest-to-goodness buyer of expensive wine wants an answer to his question and they can’t be bothered – in this market?! So, all I can do, since I didn’t see or taste the wine is give it my best guess. How hazy was it? If it was only slightly hazy and tasted good, it could be that the winemaker didn’t want to risk losing character by taking extra steps to clarify the wine. There are those who believe that fining and filtration take away from the wine and prefer bottling the wine hazy to further processing. Pinot Noir seems to be a variety that resists clarification – it’s not all that uncommon to come across a slightly cloudy bottle. What If my Wine is Cloudy? Question from Gordon: Does it matter if a great tasting wine is cloudy? Reply: Hi, Gordon. Thanks for writing! My philosophy has always been that if it tastes good it is good. Clarity is the ideal, so haziness or cloudiness always makes my antennae go up – there could be some kind of microbiological naughtiness going on in there. But, I have to say I’ve pulled the cork on some pretty scary looking wines that were absolutely delicious. And, even if something’s gone wrong the wine won’t hurt you. It might offend you, though. If it tastes weird, take it back. Possible causes of cloudiness or lack of clarity?